From the mature brick red to the intense young violet, red wine is a total ecstasy. Apart from being just a stress buster, red wine has its health benefits and there is a huge range to suit your taste. With hundreds of red wine grape varieties, there is an immense scale of information (you can learn) about red wines. 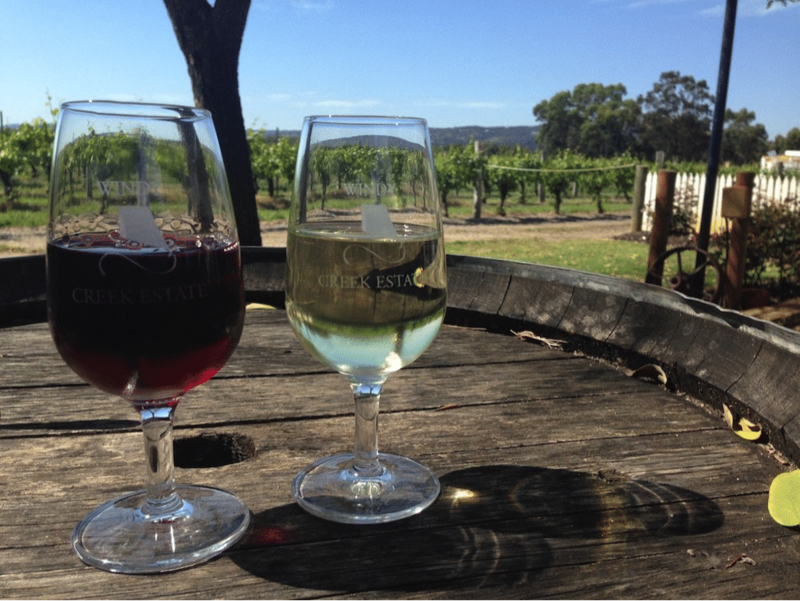 Check out Best Wine Tours in Swan Valley Perth for a relaxing & indulgent day of premium wine tasting, sumptuous food & stunning scenery as you take in the delights of the Swan Valley on our fun-filled, luxury tour bus. With our brief guide to the red wine territory, learn about the geological history and flavour profiles of the most popular red wine grapes and wine blends in the world. From Cabernet to Nebbiolo, this short guide has all you need to know about some of the most popular red wine varieties. One of the utmost black grape varieties in the world, Cabernet Franc is produced as a varietal in the United States and Canada. This grape is the primary component for ice wine in these areas. Primarily grown for blending with Merlot and Cabernet Sauvignon, this peppery perfumed grape can also be vinified alone, as in the Loire’s Chinon wine. Cabernet Franc is easily blended with stronger grapes, in the Bordeaux style, because of its finesse and peppery aroma. Cabernet Franc, being lighter than any other red wine grape, gives the wine a light-toned bright red colour. Originally produced in the Libournais region in the southwest part of France, during the 17th century period, Cabernet Franc grapes were grown at the Abbey of Bourgueil. Based on the area it is grown in and the style in which it is made, Cabernet Franc can include secondary scents like bell pepper, violets and raspberry. Albarossa is a red Italian wine grape variety, produced in 1938, from a crossing of French wine grapes Ardeche Chatus and Barbera. It is a permitted variety for use in Italian winemaking, but commercially, it has not yet been brought into use. Wine producers consider Albarossa to be a unique variety of wine grape with the quality potential of Chatus and natural resistance of Barbera. Primarily grown in the Lazio region, Cesanese Comune is a red Italian wine grape variety, commonly known as just Cesanese. It has been said that it was used in Roman winemaking as it has one of the oldest grape origins. Cesanese was traditionally used to make sweet red wines that ranged from slightly sparkling frizzante to fully sparkling spumante styles. Cesanese is widely known as Bombino, Bonvino nero, Cesanese, Cesanese nero and Cesanze nero. As per DOC rules, wines that are labelled as Cesanese must contain a minimum of 90% of the grape variety. In spite of being one of the best red wine quality grapes, its production is declining due to difficulties in cultivating and urbanisation. Cabernet Sauvignon is found widely across Europe and many major grape-harvesting areas. It is the major component in Bordeaux wine, often blended with one of its parents Cabernet Franc and Merlot. Before Merlot took over, Cabernet Sauvignon was the most extensively planted red wine grape worldwide. It is often combined with the flavours and aromas of blackcurrant, green bell pepper, black olive and black cherry. These combinations increase the quality of the wine, as it ages. The style of this premium red wine differs from area to area. While the Bordeaux style is mostly raw and unblended, the Napa Valley style is often dark and dense. Popularly known as one of the most vigorous vines, Dureza is a dark-skinned wine grape variety. Originally grown in the central part of Southern France, Dureza is an Ardeche variation. It predominately ripens late in the season and is capable of high yield production. Dureza was believed to be one of the oldest premium red wine-producing grapes but is hardly seen today. However, with the revelation of its connection to Syrah, wine producing countries have started taking an interest in the plantation of Dureza. Gamay is produced in the Loire Valley and Beaujolais. Historians believe this purple-coloured grape’s origin is as old as the 15th century and was believed to have been discovered in the Gamay village. It is a robust type of vine with a high level of acidity. Wines made from Gamay are creamy, smooth and light. On the palate you’ll pick up the flavours of black pepper, dried berry and sour cherries. Malbec is a member of the purple grape variation family, with pitch-black colour and robust nature. In 1956, after frost killed almost 75% of the Malbec vineyards, it was replanted and has maintained its reputation in Bordeaux. Wine made of Malbec has a thick and intense dark red colour. When used to create the French Bordeaux claret blend, Malbec is often combined with premium Cabernet Sauvignon and Merlot. Malbec is grown in almost every wine producing area including Oak Knoll District, Ramona Valley, Walla Walla Valley, Washington State, Columbia Valley, Napa Valley, La Rioja, Clare Valley, Central Valley and Uco Valley. Merlot is said to be one of the chief grapes used in Bordeaux. This dark-blue coloured grape is one of the most widely planted varieties in the Bordeaux wine area. France, Italy, Spain, Portugal and Central Europe are the major producers of Merlot. Merlot has qualities of its parent Cabernet Franc and half-siblings, Malbec and Carmenere. Merlot grapes are thin skinned with less malic acid and higher sugary particles. Characteristics associated with merlot change depending on climatic conditions. In cooler regions the flavours are red berry, strawberry and plum flavours. In warmer areas, black plum, black cherry and blackberry flavours are produced. Derived from the Italian word “nebbia”, Nebbiolo is an Italian red wine grape that produces lightly coloured red wines. With age, the wine made from Nebbiolo grapes creates a mature brick-orange meniscus and inculcates aromas like wild herbs, tobacco, cherries and raspberries. In its young age, these grapes can be highly tannic in nature with aromas of rose and tar. Nebbiolo is known for its unbeatable quality and texture. This grape is also known to be indigenous to the Piedmont region where it combines to make the wine of Barolo. Known as Shiraz in Australia, Syrah is a dark-skinned grape variety grown worldwide mainly used to produce red wine. Flavour, style and aroma of the wine made from Syrah depend entirely upon the area and climate in which it is grown. In cooler climates Syrah tends to produce blackberry, mint and black-pepper flavours. Syrah grown in regions with moderate climate are dense in nature and highly tannic. Whereas in warm climates, Syrah has softer tannin, jammier fruit and spice notes of earthy leather and liquorice. Syrah is said to be the offspring of Mondeuse Blanche and Dureza, with its history associated with the Rhone region of France. Sangiovese, a red Italian grape, is the main grape variety in many popular blends including Carmignano, Morellino di Scansano and Chianti. This grape is known to be famous in central Italy, and it is also famous outside of Italy for being the only component of Rosso di Montalcino and Brunello di Montalcino. With little spice, Sangiovese has fruity, strawberry flavours when young and develops oaky and tarry aromas when aged in barrels. This grape has a flavour profile of sour cherries with earthy aromas. Pinot noir belong to the grape family of Vitis Vinifera. This grape mainly grows in cold regions, with its root in Burgundy, France. Internationally, Pinot noir is known to produce first-rate wine but it is rather difficult to cultivate and turn into wine. It is mostly grown in the regions of Central Coast, California, Walker Bay, New Zealand and Australia. Pinot noir produces light coloured and medium bodied wines because of the lower amount of phenolic compounds. Pinot noir has a sweet aroma with cherry and strawberry on the nose. With age they have an intense aroma of plum, beetroot, blackberry and tomato leaf. Internationally, Grenache is a very popular red wine grape. This varietal ripens late as it needs hot and dry climatic conditions to grow. It is said to have originated in Spain but is also found in Southern France, Australia, the Italian isle of Sardinia and California. Other than being berry-flavoured, Grenache is generally spicy and soft on the palate, and can be used to produce wine high in alcohol. Grenache wines usually lack in colour and acidity so it’s mostly blended with Carignan and Syrah, which gives Grenache its colour and texture. This thick black-skinned wine grape is produced in over 10% of Californian vineyards. It was earlier considered to be “America’s vine & wine”. Zinfandel typically produces a sturdy red wine, but it varies from place to place. For instance, in the United States, the taste is a semi-sweet rosé, as it contains a high sugary component. This being the case, fermenting Zinfandel with high levels of alcohol that exceeds 15% is possible. Flavours that are associated with Zinfandel include raspberry, raisin, prune and black cherry. Posted in Wine Guide and tagged red wine guide on 12th June 2017.